Reduces the following symptoms: Acne, rough skin, dermatitis, skin irritation, chafed skin, eczema, canker sores, inflammation of the corners of the mouth, inflammation of the lips, inflammation of the tongue. *Consult a doctor or pharmacist if these symptoms do not improve after using the product for about a month. Take the following amount with warm or cold water. Do not swallow the desiccants in the product's package. Glucuronolactone 200 mg Supports the liver's functions of detoxifying and expelling unneeded substances in the body. Coix extract 77 mg (equivalent to 1,001 mg crude drug） An herbal medicine that helps improve acne and rough skin. L-cysteine 30 mg An amino acid that is a component of skin cells, is involved in energy metabolism and promotes the metabolism of the skin. Riboflavin (vitamin B2) 30 mg Supports the health of skin and other tissue, and regulates skin turnover. Also helps normalize sebum and protein metabolism. Using this product may cause urine to appear yellow. This is due to the vitamin B6 contained in the product that is absorbed by the body and excreted in urine, and is not cause for concern. Reduces the following symptoms: Acne, rough skin, inflammation of the corners of the mouth, inflammation of the lips, canker sores, inflammation of the tongue, eczema, dermatitis, skin irritation, chafed skin. Adults (15 years and up): Drink 1 bottle (50 ml) once a day. The vitamin B2 in this product may cause urine to appear yellow, but this is not cause for concern. The following symptoms, for individuals who have adequate physical strength and sometimes suffer from lower abdominal pain, stiff shoulders, headache, heavy headedness, dizziness, or hot flashes with cold feet. * Female hormonal symptoms: Physical and neuropsychiatric symptoms (including unstable mood or irritability) due to fluctuation in female hormone levels due to menstruation, pregnancy, childbirth, menopause, etc. Take the following amount before or between meals with warm or cold water. 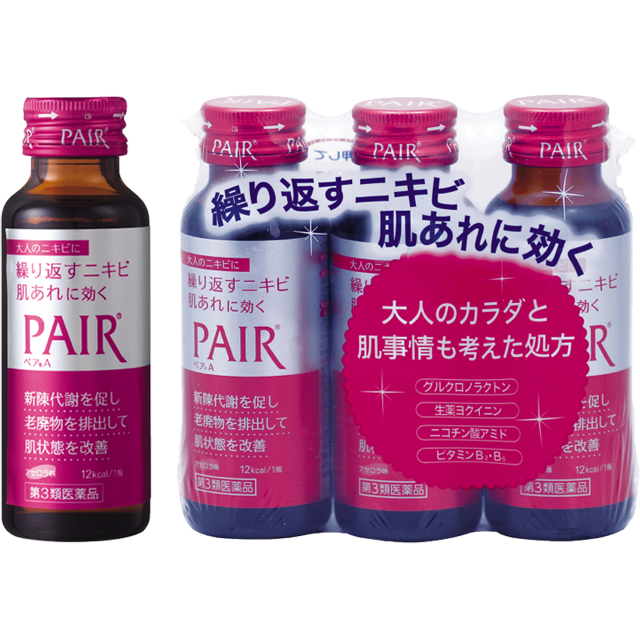 8 PAIR® Kanpo Extract Tablets (1 day's dose) contain the following ingredients. Because this product is made with natural herbal medicines, tablets may vary somewhat in color, but these variations do not affect the product’s efficacy. Multiple times a day, wash the face with soap, then apply a thin layer to the affected area. Use the product only on the area affected by pimples and acne; do not apply broadly to the surrounding area. Avoid getting the product in the eyes. If the product gets in the eyes, wash immediately with warm or cold water. If irritation or other symptoms are severe, seek treatment from an ophthalmologist. For administration to children under the supervision and guidance of a guardian or caretaker.